It is time to plan your kitesurfing holidays? Are you wondering which is the best Kitesurfing Season in Sardinia? If you are looking for a long week or even months of strong winds, Sardinia, and in particular the south of the island, can offer among the best spots for kitesurfing in Europe. On this page you could understand which is the Sardinia Kitesurfing Season, which are the winds of Sardinia, which are the best Kite Spots of Sardinia and where to have Kite Lessons in Sardinia. Sardinia is the second-largest island in the Mediterranean Sea. The coast of Sardinia (approximately 1900 kilometers) has a lot of beaches perfect for kitesurfing: great kite spots with great winds. Sardinia can be divided in the four (4) zones: North coast, East coast, South coast, West coast. With reference to the weather conditions for kitesurfing, we can say that the east coast of Sardinia is the less windy (for this reason it is also the greenest). The west coast, apart the zone of Oristano (and the famous spot of Capu Mannu, anyway not for beginners) has a morphology (many cliffs on the sea) that does not make it perfect for kitesurfing. For the above reasons, the two best kitesurfing zones of Sardinia are the South and North of the island. The main differences between the Sardinia Kitesurfing Spots of South and of North are mainly related to the quality of the wind, the air and sea temperatures, and the number of kite spots. No long ago. Kitesurf in Sardinia was associate with Porto Pollo, famous for the glorious past. good travel connections from the most of Europe’s capital and the airport and the harbor of Cagliari. In addition, the kite spots of Southern Sardinia are more variables and less crowded than the kite spots of the Northern Sardinia. Considering all the kite spots between the south east, the south and and the south west of the island, the probability of finding wind every day is really high. Cagliari with its Poetto Beach and Giorgino Kite Beach, Petrol Beach in Capoterra, Villasimius, Chia, Pula, Funtanamare, Porto Botte, Punta Trettu are ones between the the best known kite spots of Sardinia. To get detailed information on each kite spot, go to the related page. Kitesurfing Poetto (Municipality and Province of Cagliari). Kitesurfing Giorgino (Municipality and Province of Cagliari). Kitesurfing Quartu Sant’Elena (Municipality of Quartu Sant’Elena, Province of Cagliari). Kitesurfing Petrol Beach (Municipality of Capoterra, Province of Cagliari). Kitesurfing Geremeas (Municipality of Quartu Sant’Elena, Province of Cagliari). Kitesurfing Villasimius (Municipality of Villasimius, Province of Cagliari). Kitesurfing Costa Rei (Municipality of Muravera, Province Cagliari). Kitesurfing Chia (Municipality of Domus de Maria, Province of Cagliari). Kitesurfing Pula (Municipality of Pula, Province of Cagliari). Kitesurfing Porto Botte (Municipality of San Giovanni Suergiu, Province of Carbonia-Iglesias). Kitesurfing Punta Trettu (Municipality of San Giovanni Suergiu, Province of Carbonia-Iglesias). Kitesurfing Sant’Antioco (Municipality of Sant’Antioco, Province of Carbonia Iglesias). 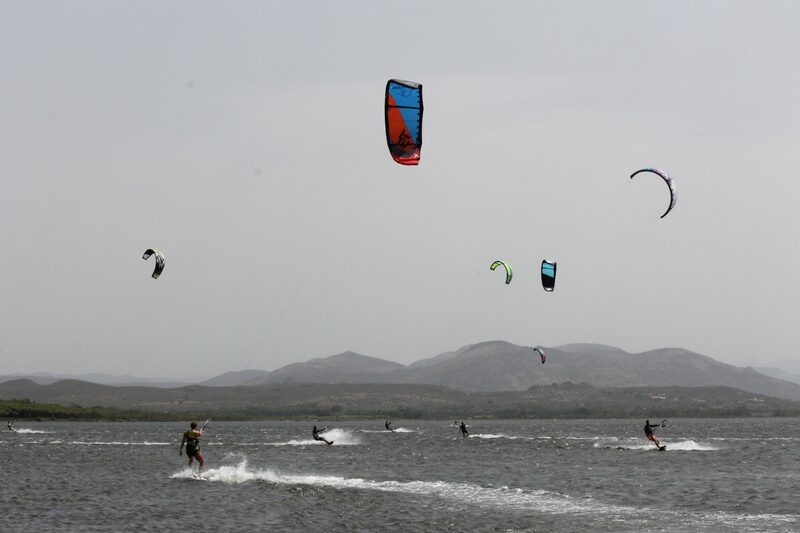 Kitesurfing Funtanamare (Municipality of Gonnesa, Province of Carbonia Iglesias). In North of Sardinia, the most frequent winds are Mistral (NW), Tramontana (N) and Grecale (NE). In the North, those wind are usually gusty because the nearby Corsica. 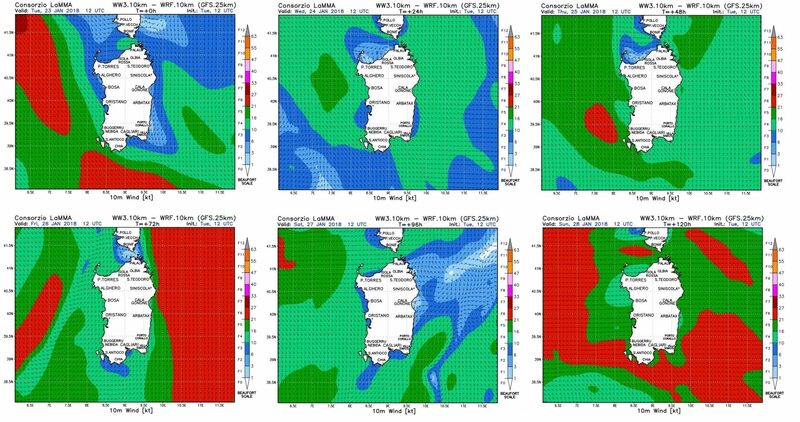 In South of Sardinia, the most frequent winds are Mistral (NW), Sirocco (SE) and, in some kite spots, the thermal wind. In the South, those winds are usually steady. With regard to the thermal wind, this wind born from the difference in temperature between the masses of air above the sea and those above the earth. From April to September, in the hottest and clearest days, the warm air above the earth is moving up and and the vacuum generated by this movement is filled by the the cold air above the sea. This air movement is called Thermal wind. In some beaches (e.g. Poetto Beach of Cagliari, Petrol Beach, Giorgino), this thermal wind, in some conditions, can blow even more than 20 knots. Now that we have understood the most frequent winds in Sardinia, we will have a look at the wind statistics of Sardinia. wind statistics have been radically upset by the sudden changes in climate, not making very predictable a prediction that is only mathematical. For this reason, the experience of local is really important to make great satistics and to find the proper wind in the proper kite spot everyday. In the north of Sardinia, the most famous kite spot is certainly Porto Pollo. Its strong winds from North West (intensified by a Venturi effect created in the mouths of Bonifacio) have made Porto, since the ’80s, a paradise for windsurfers. Now Porto Pollo has became even a beach for kitesurfing. The percentage of days with wind stronger than 4 bft (11-16 knots) is more than 60% in July and September, the months, statistically, more favorable. All the north coast of Sardinia has kite spots (e.g. Porto Pollo, Badesi, San Teodoro) with excellent wind statistics from April to October. In the south of Sardinia, there are several famous kite spots e.g. Funtanamare, Punta Trettu, Porto Botte, Chia, Cagliari, Villasimius. Punta Trettu and Porto Botte have similar wind statistics. Even thanks to the thermal winds, those kite spots have excellent wind statistics throughout the year, with peaks 90% of month windy days more than 4 bft. This is the reason why, Porto Botte and especially Punta Trettu are always in the first positions of the chosen destinations for kitesurfing. Going to the south of the Island, there is the Kite Spot of Chia, a heavenly location where kitesurfing is practiced in every season, with optimal conditions in autumn and winter with the winds blowing from East. in Chia, statistics say 50% of windy days above 4 bft / 11-16 knots, all over the year. The area of Cagliari, from Poetto Beach to Giorgino and Petrol Beach, offers for sure perfect conditions for teaching and practicing kitesurfing: perfect winds and beaches allow you to kitesurf safety. The beast winds in the area of Cagliari are Scirocco (SE), Levante (E) and the Thermal Wind. in the area of Cagliari, statistics say 80% of windy days above 4 bft / 11-16 knots, all over the year. Going further to the south-east of Sardinia, there are the kite spots of Villasimius, where the best winds is the Grecale (NE), blowing especially during the autumn season. 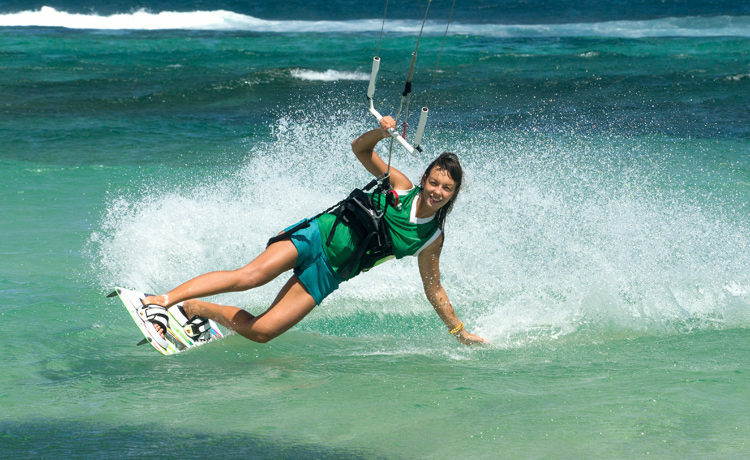 In Villasimius, the percentage of days good for kitesurfing is approximately 40%. Here under you can find a comparative table with the average of temperatures in Souther Sardinia. In addition to the above, we can add something more to understand the Kitesurf Season Sardinia. We can say that in Sardinia the mildest period with the highest percentage of sunny days, goes from March to October. 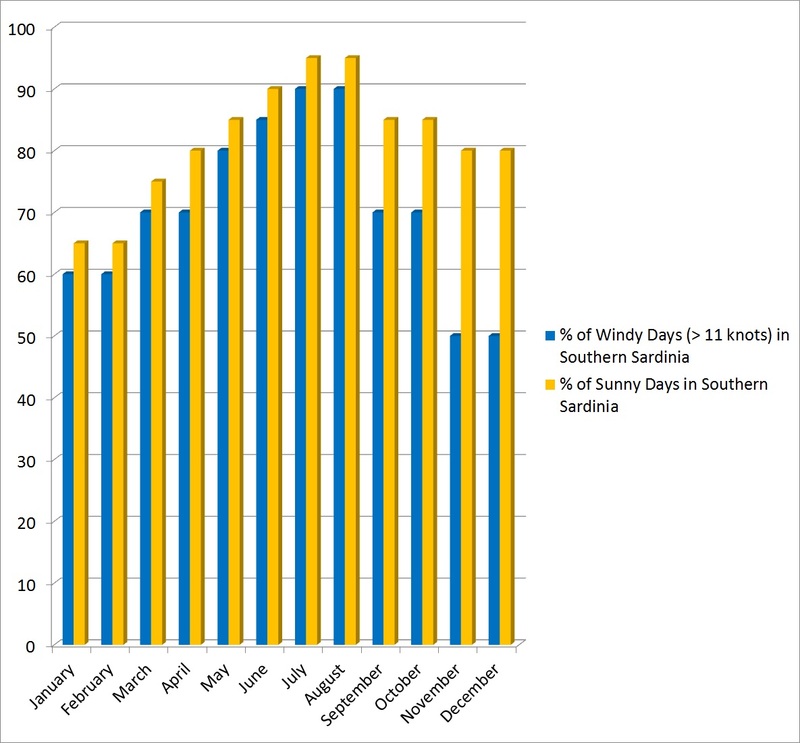 November and December are months still good from the climate point of view, but the percentages of windy days are lower than in the other months. January and February are months with pretty good percentage of windy days but the temperatures are lower than in the other months and the percentage of rainy days are a bit higher. Kitesurfing Sardinia January and February: January and February can be or no (it depend on the day) a good months for Kitesurfing Sardinia: percentage of very strong days are quite high but temperatures and sunny days are the lower in respect of the other months; beaches are not crowded and so kitesurfing is allowed in all the kite spots; use of a long wet-suit is needed. Kitesurfing Sardinia March: March is a good month for kitesurfing in Sardinia (high percentage of windy days and warm temperatures); beaches are not crowded and so kitesurfing is allowed in almost all kite spots; use of a long wet-suit is recommended. Kitesurfing Sardinia April: April is a good month for kitesurfing in Sardinia (high percentage of windy days and warm temperatures); beaches are not crowded and so kitesurfing is allowed in almost all kite spots; use of a long wet-suit is recommended. Kitesurfing Sardinia May: May is a very good month for kitesurfing in Sardinia (very high percentage of windy days and warm temperatures); sometimes beaches are quite crowded and for this reason kitesurfing it is not always possible in all the kite spots; use of a shorty wet-suit is always recommended. Kitesurfing Sardinia June: June is a very good month for kitesurfing in Sardinia (very high percentage of windy days and warm temperatures); because the beaches are very crowded, kitesurfing is only possible in some kite spots with dedicated kite zones / areas; use of a shorty wet-suit is always recommended. Kitesurfing Sardinia July: July is a very good month for kitesurfing in Sardinia (very high percentage of windy days and warm temperatures); because the beaches are very crowded, kitesurfing is only possible in some kite spots with dedicated kite zones / areas; use of a shorty wet-suit is always recommended. Kitesurfing Sardinia August: August is a very good month for kitesurfing in Sardinia (very high percentage of windy days and warm temperatures); because the beaches are very crowded, kitesurfing is only possible in some kite spots with dedicated kite zones / areas; use of a shorty wet-suit is always recommended. Kitesurfing Sardinia September: September is a good month for kitesurfing in Sardinia (quite high percentage of windy days and very warm temperatures); sometimes beaches are quite crowded and for this reason kitesurfing it is not always possible in all the kite spots; use of at least a shorty wet-suit is always recommended. Kitesurfing Sardinia October: October is a pretty good month for kitesurfing in Sardinia (quite high percentage of windy days and warm temperatures); beaches are not crowded and so kitesurfing is allowed in almost all kite spots; use of a long wet-suit is recommended. Kitesurfing Sardinia November: November is a pretty good month for kitesurfing in Sardinia (quite satisfactory percentage percentage of windy days and of temperatures); beaches are not crowded and so kitesurfing is allowed in all kite spots; use of a long wet-suit is needed. Kitesurfing Sardinia December: December is a pretty good month for kitesurfing in Sardinia (quite satisfactory percentage percentage of windy days and of temperatures); beaches are not crowded and so kitesurfing is allowed in all kite spots; use of a long wet-suit is needed. Which is the Top one of the Best Sardinia Kitesurfing Spot? In Sardinia the wind direction could change even everyday. Mistral (NW), Scirocco (SE), Libeccio (SW), Levante (E), Thermal Wind, etc, can blow from a day to another one. Would you like Learn to Kitesurf in Sardinia? Take Kitesurfing Lessons from KiteGeneration, Kite School in Sardinia. This professional kite school, has qualified and experienced Instructors., follows the professional methodology of IKO, FIV and VDWS for teaching kitesurf, and uses Radio helmets for a perfect communication Student-Instructor. Giorgino Kite Beach of Cagliari. 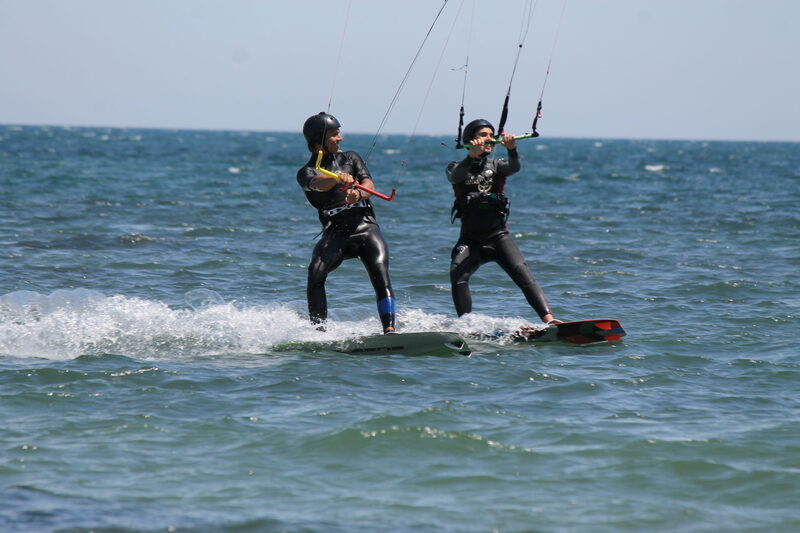 You can find more information on Kitesurfing Lessons by KiteGeneration on this page. If you have appreciated this Guide on Sardinia Kitesurfing Season please share it. Hope to see you soon while Kitesurfing Sardinia!